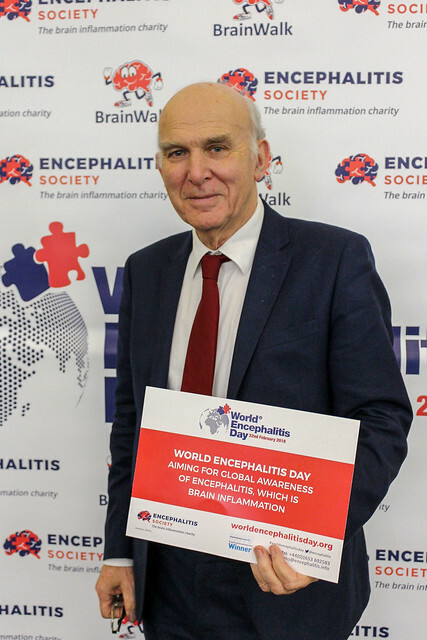 The House of Commons was the historic setting for the launch of our campaign for World Encephalitis Day 2018. We were invited to London to unveil BrainWalk – our super-duper smartphone App - by Kevin Hollinrake who is the MP for Thirsk and Malton in which our headquarters are based. After an early train trip to London, the truly day began with Ambassador Rebecca Adlington and our Chief Executive, Dr Ava Easton, filming footage for our BrainWalk promos in the – frankly, freezing! – London morning air. You may have already seen some of this footage and the photos from our Facebook and Twitter pages. Thankfully, we were able to defrost quickly when we entered the MacMillan Room in the House of Commons for the drop-in with Members of Parliament. It was here that we welcomed around 30 MPs from up and down the country, including Iain Duncan Smith, Priti Patel, Vince Cable as well as Baroness McIntosh of Pickering, who is our Vice President. Several had been urged to come and visit us by members of the Encephalitis Society who had sent them a letter – thank you to everyone who did! We explained to the Parliamentarians about BrainWalk and our ambitions to raise awareness of encephalitis for World Encephalitis Day. We also mentioned our hopes of reaching our target of 52 million steps by the end of February 22 – which resulted in some raised eyebrows! Little do they know about the determined nature of our supporters! Towards the end of the afternoon, we were joined by some other special guests, including a lot of familiar faces who have become very good friends of the Society. They were the sponsors, winners and supporters of our Accumulator Challenge who, in November, had raised an amazing £14,000 between them. We had invited them to join us at the House of Commons so we could hand out awards as a thank you for all their efforts. I hope they got as much of a kick out of it as we did! When all the fun and games of the Accumulator Challenge were at an end, we managed to pack up our gear and, most of the weary team, jumped back on the train back up north to Malton - bringing an end to a busy, tiring, and very successful day in the nation’s capital!